off topic, but had to share (not my twitter btw), but had a chance to see the Blue Angels do a few formation fly-bys at work today a few hundred yards away on the north side of the lake. Nothing is more Seattle than Seafair. The luster has left some of the event, since they went to mostly turbine powered boats. But, if you ever get to watch the old timer boats on the lake, it is as good as a major nascar event. Everyone should experience one time. Bill Muncey and Chip Hanauer. Those things were insanely loud. One of those random childhood memories that left a lasting imprint in my brain. Thanks, Rob. As always you provided clearly articulated, substantive info. I liked hearing your tempered expectations of Shaquem G., saying he could become a nickel linebacker and special teams contributor. It’s going to be fun watching how this iteration of the ‘Hawks turns out. Your level perspectives plus those of so many posters make this site the best place to follow the team. Rob, I can see the view you have, and I have a friend who owns a couple of season ducats that complains about the preseason games (his cost is the same as regular), but he can afford it so…. The preseason games are a chance to see some of the guys I have looked at as a draft addict. I am not sure that I learn anything from the exercise, but it feels like it. A chance to look at rookies who may not play for a year or two, or may not make it at all. Once in a while a glimpse of something, like with Michael Bennett, who flashed right away, but was discarded, only to come back for some glory. The four game preseason will be with us awhile, if only because it makes money for the ones who want the profits. Two games would make more sense, but not more cents. I agree and disagree with the preseason thing. There should absolutely be a bigger emphasis on practicing, but 4 preseason games gives you tons of different looks at guys against starters, I’d like to see a lot more of 1st team/2nd team splits instead playing all your starters for a bit. I don’t follow the preseason games very hard. But they are useful in gauging a rookies progress. And working on the offensive line cohesion, Seahawks need lots of that. I’m okay with the four preseason games, but I would change my opinion if they lengthen the regular season. There are only so many games these guys are capable of staying healthy for. If anything, I would wish for more practice time with the rookies. I won’t say veterans as a lot of the stars skip the preseason games. And allow more contact with the lengthen practice time. Too many fines with Seahawks players scuffling in practice. I think they avoided that situation this summer. There it is. More contact in practice is sorely needed. Never understood why the NFL thought that would cut down the injuries or the ‘infighting’ which isn’t such a bad thing for me personally. My prediction for Hawks secondary by end of 2018-2019 season. LCB Shaq Griifen – cements position as an elite starting CB. Slot CB Justin Coleman- Gets extended on a 3 yr deal as the best CB in the Pete Carroll era. FS Tedric Thompson- no one can replace Earl but Thompson becomes a ball hawk and turnover machine. SS Bradley Mcdougald- once again no one can replace Kam but Mcdougald is a solid veteran presence who provides good run support and may actually be better than Kam was covering TE position. Will they be the intimidating and boisterous LOB of course not. But I would not be surprised if they are as every bit as effective by 2019-2020 and a top 5 unit in the league. I think Griffin and Flowers in particular have star potential. I was at practice today. Tre Flowers looked impressive. McDougald might’ve been the low-key defensive standout last year for this team. I kind of wish we could see a young duo of Tedric Thompson and Delano Hill. I do understand your point of view, we’re always going to like the guys we drafted more. 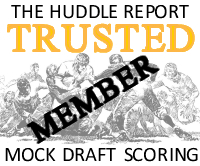 But McDougald is the real deal – we need the best players out there. Speculation, but trading FS-Thomas for DE-Mack from Oakland (straight up or with late round draft picks included, going either way) would seem to make sense for the Seahawks given the current state of their pass rush. A remote possibility? Maybe? Cap increase should be only the difference between ET & Mack’s millions so not as impactful as it sounds, while potentially solving the Seahawks pass rusher deficit. I say, make it so. Mack could be a monster in Seattle. No way Oakland makes that trade. yeah, would love to see it happen, but cannot for the life of me figure out why Oakland would do it. Oakland would have to be insane to do that. Mack is the real deal. Can’t let a pass rusher like that depart for a 29-year-old safety. Listening to the podcast, it seems like Seahawks greatest issue is injuries of pass rushers. I was looking for more information, but drawing a blank = and I don’t remember all that was said on the podcast. Can someone summarize who is injured, when they are expected back, and who isn’t injured and their status as a starter versus trying out for the team? WR competition is going to have some tough decisions. Baldwin, Lockett and Brown are locks, Marshall is a semi-lock, Darboh has looked real good so far, they seem enamored with Moore. Then you have guys like Marcus Johnson and even Keenan Reynolds in the slot. I’d bet on the first six. Anybody else see LJ make his debut for Balty? He looked like a college QB. Lot of things I want cleaned up. His release point and throwing motion are super wasteful if compact and quick. Release lower than 3/4s and isn’t really being asked to make drops yet. He was extremely fast and threw with power and altered velocities. Seemed to be completely overwhelmed by the sheer physicality and tackling techniques of the pro game. And got nothing after contact. Didnt break a single tackle that I saw. So I mean he has the physical talent to totally dominate the league in a way unseen since prime Vick. Good read on his TD and you could see immediately he wanted his INT back after he was late and weak-armed a comeback route to the flanker. Almost looked like he changed his mind at the last second and it effected his follow through. Like RW, bails way too soon. But also like RW you can do everything right as a defense and be 100% assignment sound and they’ll still find ways to beat you and move the sticks. My big takeaway from last night was that new helmet rule. Just awful. Gonna be nearly impossible to officiate and will cause defenders to second guess leading to more bad football. Then again this is the ‘shield’ we’re talking about here. IDK why it surprises me. I made it over to the VMAC today to catch practice. Just a few notes. 1. Offensively, it was a bit of the Russell Wilson Show, but the running backs mixed in with pass and run plays, and they look really fast. This could be a serious area of strength if folks can stay healthy. 2. Tyler Lockett looks like he is fully back as a receiver. 3. Will Dissly looks like the second coming of Zach Miller. 4. Tre Flowers jumps out physically, and moved better than I anticipated he would. I think he might push for time if he shows up in preseason games. He showed some close against the run, and we all know that if you want to play corner in Seattle, you have to be a plus defender against the run. 5. Disappointingly, they didn’t practice pass rush drills much (didn’t seem to do much 1v1) but what was happening, Naz Jones seemed to be especially getting long looks on stunt drills, more so than the other inside guys. Also, Naz looks noticeably slimmer from last year, almost Jason Jones looking. Don’t be surprised if his role is to be the role they envisioned for Malik McDowell. 6. In the DE group, Rasheem Green stood out, Brandon Jackson did a bit, but will be interesting to see what Jacob Martin does in games. He is not a big guy, at all, but looked bendy. This is the area that concerns me the most, but like I said, there wasn’t much activity to judge. Clark was back into some drills. 7. Shaquem Griffin took Carson down to the ground on a play. Didn’t seem like that was something he was supposed to do, but it was nice seeing that kind of physicality and toughness out of him. Dude is really fast in person. I’ve been waiting to hear about Dissly being a stud, but now I realize, if he’s Zach Miller, he wont get buzz because Miller didn’t even get buzz lol. Lockett comeback player of the year? I’ll take that bet to Vegas. Vannett seemed to be the guy getting most of the action with the ones. Dissly was getting extra work after scrimmage running curl routes, and looked really smooth with his hands. He was also working the blocking sled. Just stature-wise and feel, he looks like Zach Miller 2.0, which I take away as being a plus. Thanks for the notes C-Dog! Didn’t Shaquem get a run with the 1’s? Interesting point you make on Naz. He was running with the ones. Really excited to see what he does in these preseason games. That’s totally a made up name. So Pete made it clear that he pulled Ifedi after the penalties, Battle replaced him. With Jamarco Jones doing okay at LT, I’d let him compete for the backup spot and have Fant make the switch to the right side. Not a fan of Fluker at RT, would much rather have the competition at RG between him, Sweezy and Roos. Leave RT for Fant, Battle and Ifedi. Are we seeing the end of Ifedi’s career in Seattle? He needs to step it up this year. I don’t think we’ll ever see Fant take a live snap at RT in a seahawks uni. Like Rob says in the podcast. Don’t put so much stock into what happens the first week of camp. Wilson was 3rd string his rookie year to start camp. Ifeldi had the offseason to fix false starts & holding penalties! So far in camp he hasn’t improved Pete Carroll has a long history of immediately addressing previous seasons problems. A running team cannot have OL penalties we must do something, anything is fine with me, but do something! Do we need all the head holding? It really, to me sounds like they are totally doing something. I just don’t think Ifedi will ride the pine for long. Ifedi’s penalties were ridiculous and theyre helping him with that now. I’ve never heard Pete be as critical at someone like he was to Ifedi. Wow, that really caught me off guard. Electric dog collar, shock him every time he commits a penalty. Better than getting cut! I think thats the idea. They’re flagging everything he does and sending him to the bench in a training camp that doesn’t really matter in the long run. If they put a real one on his neck, sync it to the ball snap, if Ifeldi moves prior to the ball snapping ZAPPP! He’ll be fixed in 30 days or sooner! I thought the exact same thing when I heard him talk about that. Nice to hear some other than glowing praise for everyone and assign some concern that will hopefully force some change. If I was Ifedi I would have put in a ton of work doing whatever it took to fix the penalty problem. I hope the continued problems in that area don’t represent a bad work ethic or a lack of committment to improve. Not a fan of the right side of this line at all. Liked Ifedi coming out due to his size and potential, but at at this point he’s on his way to diminishing returns. Any stats gurus out there able to determine the split of Ifedi’s 2017 false start penalties referencing RUN vs PASS plays? How about the play he just got pulled for? I’ve made no effort to conceal how I feel about Ifedi. I think he was a waste of a pick and we would get better production by putting out one of those confusing fun house mirrors. Pete’s comments were some of the most damning he has ever publicly made against a player (that I’ve seen). I mean, Walsh literally lost games and Pete still didn’t say anything like that. Here’s to this being the beginning of the end of the Ifedi experiment! Let’s at least play a pre-season game before we write anyone off. It’s funny how much hatred fans have for random OL players. A good running team wouldn’t have noticed Ifedi’s penalties the way some fans do. Start doing something right on offense and then we can talk about the little things. Instead we act like those penalties lost us six games. Why do we want so bad to be right about someone being bad? He’s just gonna go sign a fat contract and start for someone else. He’s not here by accident. And you definitely ain’t gonna coach Blair Walsh the same way you coach Germain Ifedi. Thats just a basic fundamental of coaching of course. Idk man, yes we need to see him in preseason action, yes he’s clearly got heeps of natural talent. But you have to admit, for the first time, the cracks are starting to show. Pete’s calling him out to the press, Solari is harping on about the best 5 playing, Jamarco Jones is getting work at RT. I really think if Ifedi doesnt show improvement soon he wont be on the starting 5 this year. Very fair points. The cracks are starting to show. Jamarco Jones is the biggest threat imo. I have to think they give him a few games into the season being that it’s his 2nd year at RT, but I hope the best five do play. If he’s on the bench, someone must have played really well in his place. I can imagine him going to play guard for the Ravens and doing really well when he leaves here. Is there anywhere that has the mock game available to watch? I would be interested in being able to watch it and see how guys looked, instead of relying solely on updates. Rob, what are your thoughts on Pennie’s new weight? 236lbs? Could they be looking at him as a FB year #1? That rumor comment it is very interesting. Unlike last year, I am usually attached most all of our running backs. Carson, Penny, CJ, McKessic, Davis all appeared to have the skills to be in a starting lineup. I would hate for any of them to go but that is a lot of guys in a similar skill set to keep, especially since it appears we have been looking for one more guy in FB role that is not included in that list of names. Last year it felt like we were at a one trick pony at the running back position. This year it feels like we have an entire clip of skilled guys to lock and load as we choose. Re: Last Year . . . and it was a “BROKEN” One Trick Pony . . . Better to have a full stable of studs. I highly doubt they’re going to use him as a full back. Apart from the physical punishment he’d receive, it’d be a weird way to introduce him to the league. Carson & Penny will share snaps IMO. Penny looked fast and physical to my eyes when I was at camp the other day who got easy separation down the middle of the defense on a pass play. I saw him in street clothes at a Seattle Storm game about a month ago, and he looked like he was built like a middle linebacker. Very excited about this dude. Anyone surprised Kevin Dodd hasn’t surfaced for someone? Yes, he flopped in Tennessee but he was the 33rd overall pick just in ’16? Maybe there’s more to the story that isn’t public yet? I think that is a very fai interesting question. If we weren’t so solid in the linebacker position it would probably interest me even more. I thought he was a good college player and an excellent pro prospect. He sure looked like he got in the backfield in a hurry. Thanks for the post and insight. Keep them coming! Yeah, I was expecting a little interest in him too. But I guess his behavior in Nashville was pretty a bad. What a waste. Let’s just say, KJ Wright’s back-up has been making a case to get on the field…. since he flashes and makes an impact everyday. Seahawks are going to have a hard time keeping Shaquem Griffin off the field. KJ can play both sides! He is getting older and will likely continue to be valuable teacher and tackling machine, considering the fact the hawks have to play the rams 2 times this year its probably a good idea to focus on having an elite run defense. The defense is probably still going to give up a lot of 3rd down conversions. It’s maddening but I don’t see it changing especially with an anemic pass rush. We haven’t played a game yet but I just feel this will be a thing again this year. Hopefully the interior pass rush will be pretty solid & I am curious to see if Norton will blitz a little more to help that,. Ding ding ding we have a winner. If our DTs can create consistent pressure we won’t need 20 sacks out of our DES. We have a good starting set in Jordan and Clark. I am happy with both of those guys on the field. The issue is whether they will be on the field. But yeah, take away most teams starters (plus Avril) and their pass rush will suffer. If there is any criticism to be had it is – you can never have too many pass rushers. Maybe we should have been more active in FA of the draft. Sad to see Khalid Hill waives today. Hoping you he can pass through waivers. I been out of town and have not been visiting as frequent as i am used to, so i don’t know if this was posted or mentioned recently. Saw this interview with Marshawn about the superbowl win and loss. In a time where it seems like all of the recent Seahawks star players are being looked at as tarnished, I love this dude even more. It is the most honest reaction and illustrates why everyone thought he was a great teammate. Lets hope the man he mentions can get us back there soon. I love BM. Favorite Seahawk ever! I’m calling it now, Akeem King is going to be the biggest surprise of the year, and will be a solid player. The next Thurmond if you will. Maybe a backup for a couple years but so were the likes of Thurmond. King seems to be higher on the depth chart than most, seems to be around Thorpe already, and that means he could surpass him relatively quickly. Just a bold prediction but maybe not so bold considering Pete is the DB guru and the last time he had a bunch of young guys to mold, he created multiple pro bowlers, all pros and solid starters. On the field he seems a lot like Flowers, good instincts, will hit, better ball skills than Flowers, same build but bigger, just as fast (4.43) 7.08 3 cone and 4.34 20 yd shuttle I believe are better than Flowers’ too. Hes my dark horse. Just saw that Jones moved over to RT on Sat after Ifedi was pulled. All I can say is HALLELUJAH!!!!! Sadly Ifedi was back with 1st team yesterday, but I can still hope…right? Let’s give Ifedi a chance in the games. Not to be contrary by any means, but hasn’t he already had his chance in games? I’m 100% for letting a guy work with a new coach and maybe turn a corner. My problem with Ifedi is and always has been the penalties. Penalties are a mental thing and shouldn’t be as big of a problem at this stage. Hearing he got pulled because of more penalties does not give me any faith he can turn that corner. Personally, I’d rather see what Fant, Battle, or Jones can provide in a game at this point. To be fair, the franchise has more info on Battle etc than any of us. They likely know what he would do in live snaps. It’s only Ifedi’s second season at NFL RT. Another point; what if you put all of those guys out there and one by one they fail? Then you look bad and you’re stuck with going back to Ifedi anyway or trading for a RT to save face. Franchises make mistakes (see: Joeckel, Aboushi). Everything is speculation until players are put in situations and evaluated. Have already seen Battle run with the 1s, Jones move from LT to RT and Ifedi pulled from live scrimmage. If the team’s identity is ‘always compete’ instead of ‘always entitled,’ I could see Ifedi on the bench, backing up RG and RT. He needs to come out and kick some a**, this pre-season: clean the mind, learn the skills, use the power. Personally, I’m not confident in any of the options at RG and RT. In full tilt panic mode. Not with a new coach and tweaked scheme. He was far from the only one who struggled under the previous regime. My only argument is the penalties. Penalties are coach ambivalent and are arguably more damaging than poor play. Two penalties in a practice game, which for an OT almost have to be holding or false start, are a giant red flag for me. ZERO excuse for a false start in any circumstances, and if he is holding against the current crop of DE/DL we are throwing out there we have some serious problems. Pete came strong with those comments about Ifedi. However i cannot understand Jones being the first man up if that’s the case. Its like we can’t go one year without a rookie weak point along the line. I personally think he needs a year to bring up his technique to make up for his lack of athleticism. Battle has been around a while and is a known commodity that is lacking as a starter. If healthy, i can’t see how it is not Fant at RT. This time last year he was the best lineman on the team minus Britt i guess. I know they want to keep him on the left but its a waste. For a Pete to still preach position versatility on the OL it makes no sense to be concerned with staying on one side. We have seen swing tackles before. I was always taught to put your best 5 out there. And the always compete says Ifedi’s first round status shouldn’t matter. The probability that both Battle & Ifeldi are failures at RT is extremely low! Typical for a rookie in the NFL to be on the final 53 as a back up! Fant has how much experience playing football? It’s really hard to evaluate Fant from afar but we do have evidence he can play LT & LG at the NFL level, a miracle for a guy whose spent his life playing basketball. Throw him into the fire and see how he responds. For all we know he’s killing it in the meeting rooms and film sessions. Keep an eye on S. Carolina WR Bryan Edwards (6’3, 215 lbs). Stepped up big when Deebo Samuels went down for them last year. Hes the real deal. Love the prospect watch starting up already V12. Just thought about something. We are going to have to keep an eye on the new Football leagues starting up in January. I just saw that the Alliance of American Football league just signed its first 100 players. Guys fall between the cracks all the time. The early Pete Carroll era was built on them. I am as disappointed as everyone else about Ifedi, but we have to be realistic. I think he is the best of a bunch of bad choices at the moment. 1. The kid has 2 more years guaranteed, so they either trade him for a bag of peanuts, or keep him around and let him develop. 2. Ray Roberts and at least one other ex lineman has stated that Cable tried to make him something he was not. That training has to be adjusted by Solari. Hopefully…. 3. Do we know Fant is any good? He has an athletic profile, and so does Ifedi. Fant has little experience and none on the right side. If anyone else in camp was better, I am pretty sure they would put them in on the 1st team and let Ifedi win it back. 4. Penalties. No answers, other than it appears to be a mental hurdle for the kid, like Steve Sax trying to throw to first base. Hope we get a better ending. I think Britt will be solid, Brown very good and I expect Pocic to improve. The right side is a total wildcard, but based on the last couple years, I will take a solid 3 out of 5 on the o line. I am pretty sure they will be better than last year (low bar, I know). and based on all the moves they made after last year, if Ifedi starts, it means no one else is better. And pretty sure none of us are better coaches than PC. Source on those RR quotes? they wanted him to back up, where DE’s could run past him, instead of letting him make contact early and use his strength to either take them out or slow them down. I don’t have the exact quote, but I think RR was on 950 KRJ and discussed Ifedi… and why the hell Cable (and the gang) kept putting in positions to fail, instead of positions to succeed. He is a powerful man, who can maul DT or DEs….. instead, they were making him be like a dancing bear. There are many other examples over the last few years where former OL on 710ESPN or 950KJR made similar statements. Essentially, put the guys in a position to succeed, not fail. Note: You should bet the house, real estate prices are continuing to rising in Seattle. Best part about this year, no stressin the Hawks season. If we win a bunch that’s great. If we lose a bunch, we get to watch the process and get a high draft slot, restocking the team with real talent. Just gonna kick back and enjoy. Bob Condotta said something about Ifedi running with the 2s all Tues and Jones taking all the 1 snaps, maybe Solari and the staff are allowing a real competition this year…lets hope! Also saw that Richie Incognito was “talking” to the Hawks, not sure how I feel about this one. On one hand, it would be an immediate improvement, even if it is a controversial player, and I’m ALL in. Controversy aside, what does that say about the staff’s confidence in the current G options? First they bring in Sweezy and now courting Incognito? Doesn’t that scream Fluker and/or others are not cutting it? Is it an injury hedge? if the Hawks talked to Incognito it was probably just a tire kicking exercise. And it may have been Richie talking to the voices in his head. His behaviour recently has gone beyond bizzare. regarding Fluker, have to always read past Positive Pete and wonder where the truth lies. I think they got Sweezey for the right price and he can be a back up or push Fluker to start. And when Positive Pete publicly calls out Ifedi, you have to think they are looking at a “shape up or ship out” scenario with him. Add in the comments from Avril, who would have gone directly against him in practice all the time, and I think they are trying to light a fire under the kid. Pete was gushing in his praise of Fluker yesterday. But I suspect that maybe they are concerned about his ability to play 16 games. Thus the Sweezy signing and the confirmation Sweezy was competing at solely RG. That makes sense, I dont know that Sweezy is a solid 16 game answer either.